TERMINAL TACKLE → Hooks → Trailer → Strike King Tour Grade Trailer Hook 4ct. Strike King Tour Grade Trailer Hook 4ct. The Strike King Tour Grade Trailer Hook with keeper is designed to work with spinnerbaits, buzzbaits and even topwater frogs! 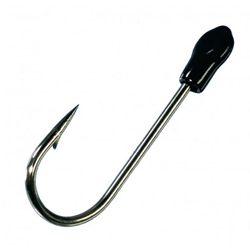 The Tour Grade Trailer Hook incorporates a unique locking cap on the eye of the hook to help keep the hook in place while in use. The trailer hooks rigid design helps eliminate the quess work when adding a trailer hook to your lures.